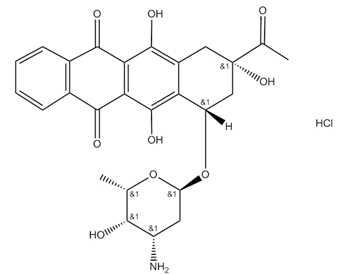 Idarubicin is a semisynthetic 4-demethoxy analogue of the antineoplastic anthracycline antibiotic daunorubicin. Idarubicin intercalates into DNA and interferes with the activity of topoisomerase II, thereby inhibiting DNA replication, RNA transcription and protein synthesis. Due to its high lipophilicity, idarubicin penetrates cell membranes more efficiently than other anthracycline antibiotic compounds.
. Cersosimo RJ, et al. Epirubicin: a review of the pharmacology, clinical activity, and adverse effects of an adriamycin analogue. J Clin Oncol. 1986 Mar;4(3):425-39.
. Ozkan, A., et al. Epirubicin HCl toxicity in human-liver derived hepatoma G2 cells. Pol J Pharmacol, 2004. 56(4): p. 435-44.